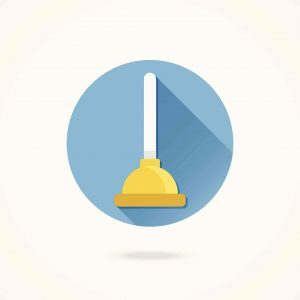 Using a plunger is one of many, useful ways to unclog your toilet. It always happens at the most inconvenient time. It strikes fear in the hearts of every bathroom owner. It can mean a late night visit from the plumber (and nasty bill as well). What are we talking about? Toilet clogs. Nobody likes dealing with a toilet clog, but they are a fact of life for every bathroom owner. If your toilet is clogged, don’t panic. First, try some of these simple tips to help you unclog your toilet. Everyone should have a plunger in their home (and if you don’t, take this toilet clog as a learned lesson that you should!). Place your plunger firmly against the hole at the bottom of the toilet bowl and make sure that the top of the base is completely submerged. This will help to make a tight suction seal that will assist in pulling the clog out of the toilet. If your toilet is clogged without much water in the bowl, add some water from the sink. Plunge as quickly and deeply as you can without splashing any water around. Just like you did in elementary school to make a volcano, gather baking soda and vinegar from your pantry. These two ingredients, when combined, are more powerful and more gentle than many other commercial cleaners. Bring a pot of water to a boil and let it cool for about five minutes. Meanwhile, place one cup of baking soda into your toilet bowl with two cups of vinegar. Next, add in the slightly-cooled water, without overflowing the bowl, and let it soak for at least a couple hours. This clever trick will almost always unclog your toilet. Do you have a plumbing snake? That can help get rid of almost every toilet clog known to man. Carefully feed the flexible end into the hole at the bottom of your toilet bowl. When you feel it push up against the clog in your toilet, twist the handle of the plumbing snack to help unclog the toilet. This entry was posted on Friday, June 23rd, 2017 at 5:57 pm. Both comments and pings are currently closed.